52 x 26 3/4 inches; 132 x 68 cm. Provenance: R. Kirkman Hodgson, his sale, Christie's, 21 November, 1924 (lot 18, bought by Sampson); Private collection, Yorkshire. Exhibited:	RA 1867 (34); Royal Jubilee Exhibition, Manchester 1887 (439); RA Winter 1897 "Exhibition of Works by the Late Lord Leighton of Stretton PRA" (21). 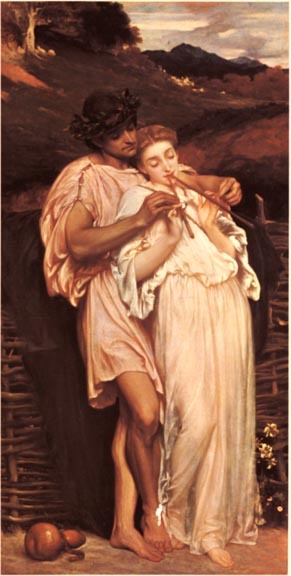 A Pastoral is one of a group of five paintings Leighton exhibited at the RA in 1867. These paintings all depict one or two figures in classical pose or costume evocative of a mood of ideal beauty; they mark a distinct break with his earlier complex crowd scenes such as Cimabue's Madonna (RA 1855) and the Syracusan Bride (RA 1866) both in their simplicity of approach and in the fact that no attempt is made to illustrate an event or story. In this year Leighton simplified his subject matter, developed a broader more urbane handling and enriched his palette in an effort to create pictures of an ideal beauty, which, he felt, related directly to the perfection of the subject matter depicted. The other paintings exhibited at the RA in 1867 were Spanish Dancing Girl, Cadiz in the Olden Times (later retitled Greek Dancing Girl), Knuckle-bone Player, Roman Mother and Venus Disrobing for the Bath. A Pastoral is one of the artist's earlier essays in his classical manner (as Ernest Rhys termed it, a painter's translation from the Latin Arcadian poets). It shows the strongly continental flavour, compositional richness, brilliance of execution, and clarity of drawing and modelling derived from Steinle and Leighton's admiration for J. A. D. Ingres, that first struck Leighton's contemporaries in his early years in England. Brooke, Anthea. Victorian Painting. Catalogue for exhibition November-December 1977. London: Fine Art Society, 1977. No. 29.